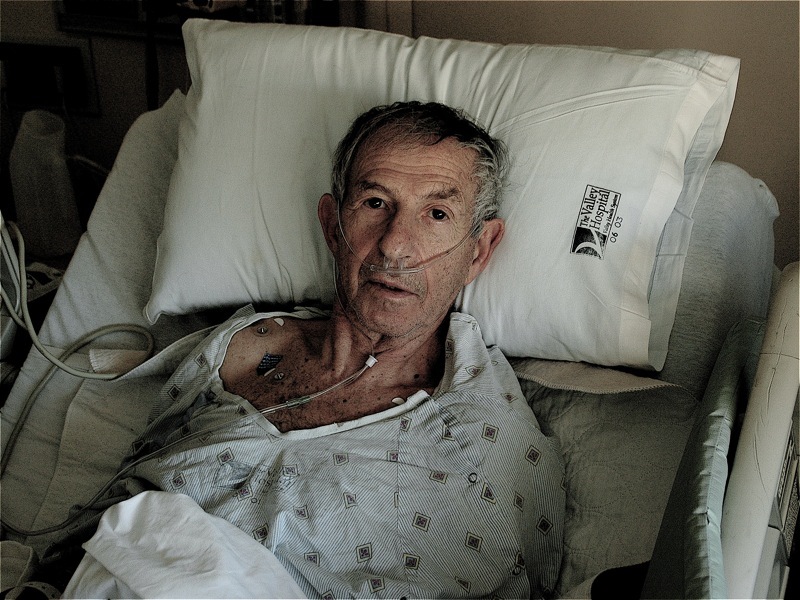 Dad in hospital., originally uploaded by Here in Van Nuys. Three years ago, October 13, 2006, I was on a plane traveling from Los Angeles to New Jersey to see my father and mother. My father, at that time, was battling a neurological illness that was slowly robbing him of his ability to speak and walk. There was, and is, no cure. And it eventually killed him. But that October, back east, there was a slight glimmer of pharmaceutical hope: some drug that was given to Parkinson’s patients seemed to help my father. He was on it for a few weeks, progressing. And then he was not. One morning, he suddenly went into a stroke like condition and then into the hospital. I took the red-eye the night of October 12th, and before I boarded the plane at LAX, my brother Rick sent me a text and said that his wife, my sister-in-law Pri, was giving birth. She went into labor that same night, the night I was on the plane traveling back east, back in time, back to Ridgewood and Woodcliff Lake and all those towns in Bergen County where my parents had lived since 1979. When I landed around 6am at Newark, a car picked me up and took me directly to Valley Hospital in Ridgewood. I found my mother sitting next to my father, who was awake and resting in a room, in a bed, next to a north-facing window. I broke down and cried and I think all of us were crying. I was so tired, and so happy to see my father alive, even as I was ripped up about his weakened condition. I had just bought my first camera, a Nikon D70. I picked it up and shot a second of my father’s life in that weak and delicate sunlight that barely illuminated the room. That he left this hospital within a few days was miraculous. Back at home, he had the after effects of the episode, and at times his hands would tremble like a post-earthquake after shock. Yet he would look down at his shaking with dispassionate objectivity and a faint smile. In Los Angeles, my nephew Ravi entered the world and there was joy and new life on the other coast. But that October is indelibly marked on my calendar as a season of impending grief and the realization that an epoch and life and existence would end quite soon. One Sunday, we took a car ride with my father, who could not walk, but used the walker and a portable wheel-chair. We drove across the Tappan Zee to Armonk and stopped for lunch in a town filled with pumpkins, white houses and children on bicycles. Then we drove up some wooded road, lined with stone-walls, passing horse farms and parkland preserves. We were heading up to see where Bill and Hillary Clinton lived, in Westchester County, just as we once had stalked Nixon in Saddle River, NJ. I apologize to Los Angeles, where I now make my home, but despite the efforts of “Mad Men” to create a fictional pathology of life in the suburbs on New York, there is still a sublime and natural beauty there, historic and meaningful towns and an un-crowdedness that soothes souls in pain. When you are sad back there, you can take a drive in the country past reservoirs, farms and fields. And that is just what we did that Sunday afternoon. Those days, spent in autumn with my late father, were among the most meaningful of my life. I meant something to him and I will never ever have the time to spend with a living father again. I follow your blog and enjoy your take on life in and around Los Angeles. But the posts I enjoy most are the reflections on your family and times spent with them in the East. It’s what originally drew me to follow your blog and I feel that your writing is most poignant when covering those aspects. Thanks so much for writing about them. Thank you so much. I appreciate your comment.